Hey friends! I have literally been trying to sit down ALL day and put this tutorial together! It’s just been one of those days! But, I am so excited about this project and excited to share it with you! 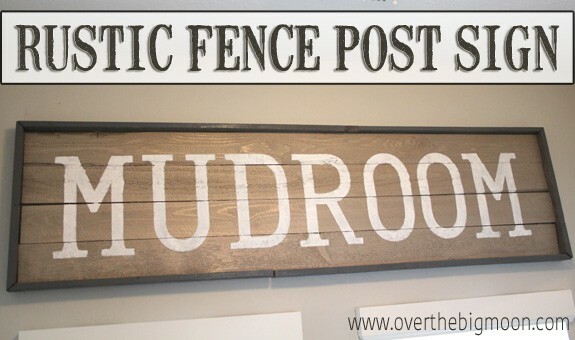 This Rustic Fence Post Sign turned out so perfect! How many of you see amazing decorative signs when you’re out shopping and they are CRAZY expensive?!? I do all the time, but generally, just can’t justify spending that much money on a sign that I know I could make. So, a few weeks ago I was at Michaels and I came across Americana Multi-Surface Paint’s and fell in love with their Metallic color options. I have been wanting to make a sign for our mudroom, so I grabbed their Champagne Metallic color, Steel Gray, Silver Metallic and White! While wood shopping I walked past the Fence Posts and knew I had found my wood! They were perfect – only $1.10 a piece and I knew I would be able to get that rustic look I was hoping for! Then for the frame I chose some wood stakes. They came in large bundles of 25 for only $14, which makes them only $.56 a piece! Score! Keep in mind when making this project, that fence posts don’t all come the exact same size and perfectly flat! 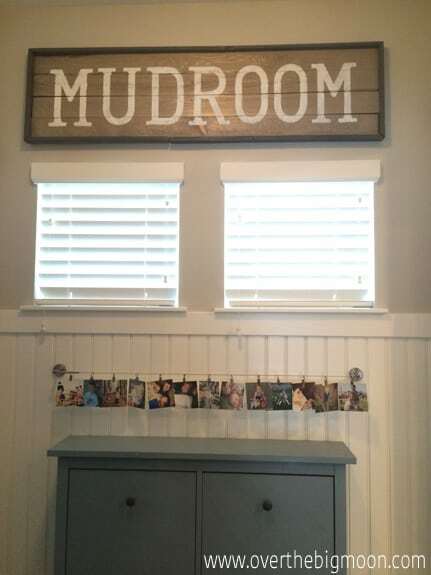 But, that’s what makes it so rustic and perfect for this type of sign! 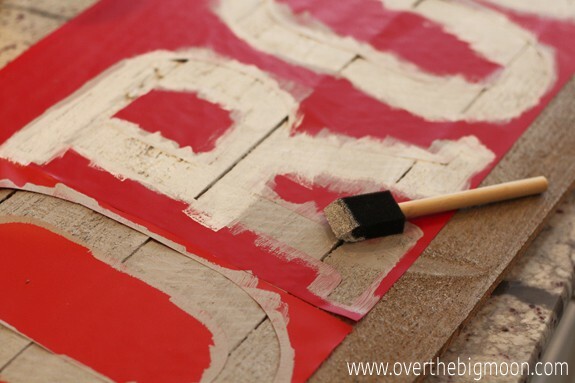 You’ll see gaps, dings, etc in different areas of the sign, which only adds to its personality! The first thing I did was get my husband on board to helping me! haha 🙂 Then we drew up a quick plan, so we’d know the cuts we needed to make. Then we got making our cuts! First, we cut 4 fence posts each 54 1/2″ long. Then we went to cut the stakes to create the frame. That is where we ran into our first issue. We only bought 36″ stakes. So, for our top and bottom, we pieced 2 stakes together. However, they do make 60″ stakes. So, if you’re going to make a sign wider than 34″ wide, then make sure you purchase the 60″ wide stakes. When cutting the stakes you will need to cut the edges on a 90 degree angle. Make sure the shortest edge of your frame is the same width of your sign. Next, you’ll want to bracket the back of the fence posts together. This helps hold it together while you paint it and also makes it easier attach the frame. We used the Stanley-National Hardware 4-Pack 0.625-in x 3-in Zinc-Plated Flat Braces. 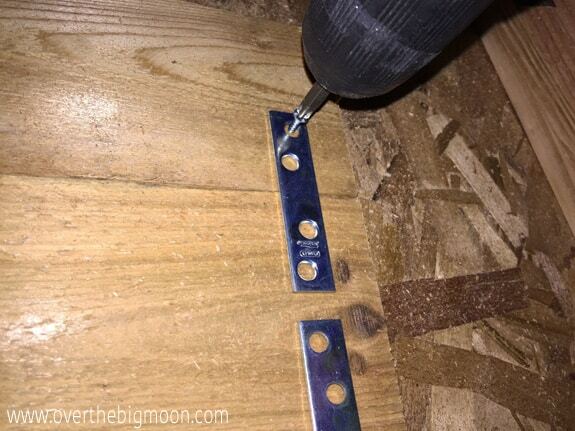 Pay attention to the screws that come with the bracket – they may be too long. 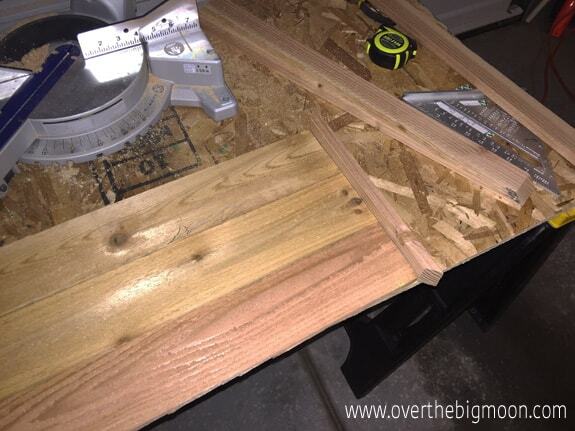 We had to get shorter screws that we knew wouldn’t go through the boards and come out the front. Then I got to painting! For the main part of the sign I got a bowl and mixed 2 bottles of the Americana Champagne and 1/2 bottle of Steel Gray. I painted the frame with Americana Steel Gray. 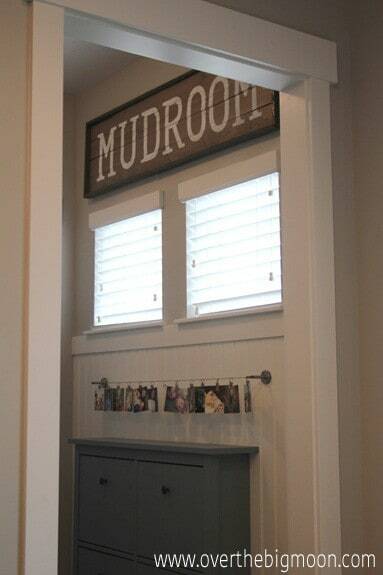 After the sign was dry, I used vinyl to reverse stencil on the word Mudroom. The vinyl was struggling to stick to the wood, because it was so rough. So, I did use some spray adhesive to help it stick better. I first painted the letters with Americana Silver. Then I rough painted with white over the top. That way some of the Silver color is peaking through in some small spots! After everything was dry, then we used our Ryobi Airstrike Cordless Nail Gun to attach the frame to the sign! I am so excited with how it turned out! 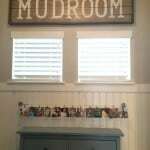 It’s so perfect for our little Mudroom! 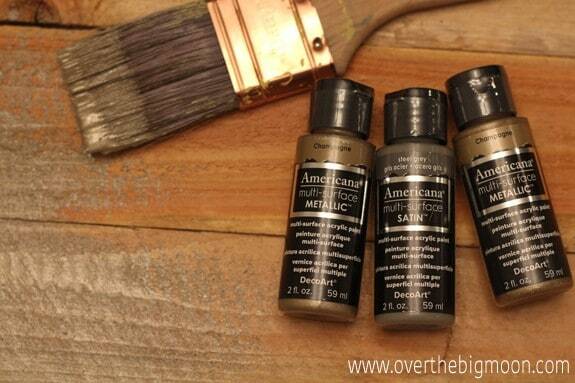 Americana Multi-Surface paint is available in Michaels. Visit the DecoArt Multi-Surface website for more crafting ideas and inspiration. LOVE this, you girls! Super cute, Pam!